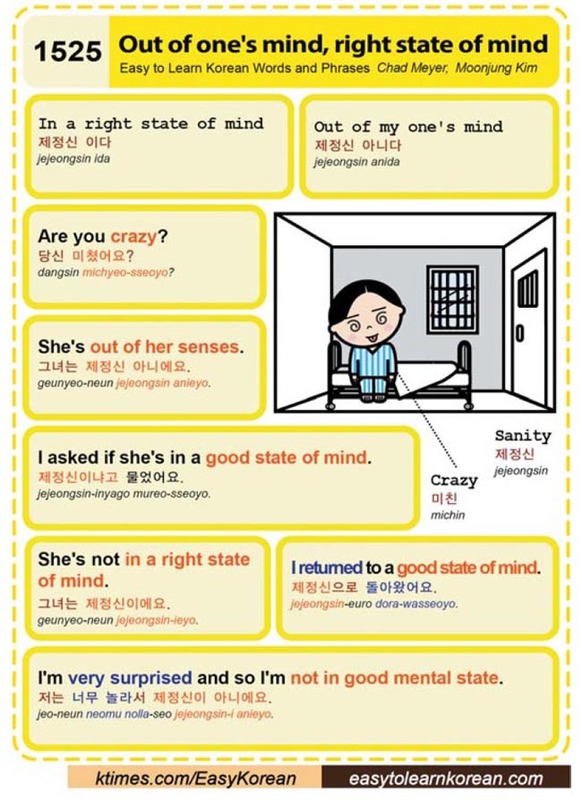 Easy to Learn Korean 1525 – Out of one’s mind, right state of mind. This entry was posted in Series and tagged are you crazy?, crazy, I asked if she's in a good state of mind., I returned to a good state of mind., I'm very surprised and so I'm not in good mental state., in a right state of mind, Out of (my) one's mind, out of one's mind, right state of mind, sanity, She's in a right state of mind., she's out of her senses, 그녀는 제정신 아니에요., 그녀는 제정신이에요., 당신 미쳤어요?, 미친, 저는 너무 놀라서 제정신이 아니에요., 제정신, 제정신 아니다, 제정신 이다, 제정신으로 돌아왔어요., 제정신이냐고 물었어요. by easykorean. Bookmark the permalink.